Please select plug-in style Please Choose Flat Plug-In (US) Round Plug-In (UK, Etc). 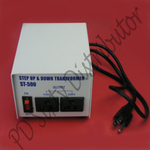 The PD60 200 WATT step up/step down transformer is suited for allowing the portable sewing machines we carry to be used in countries with 220 volt power outlets. However, we do not sell 1000+ watt transformers needed for irons and similar products. Do not use on any appliance that uses more 500 Watts of power. Check before you plug in or damage could occur to the transformer or your appliance. One grounded outlet in front of unit. Converts 220/240 Volts down to 110/120 Volts. Converts 110/120 Volts up to 220/240 Volts. Does not change cycles from power supply. Built-In Fuse Protection in rear side of unit. Can be used with European outlets.